The Newsham Park Hospital in Liverpool dates back to the Victorian period. 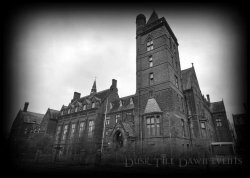 This very scary building is said to be reputedly haunted and will certainly be one of the most terrifying buildings you will ever have the chance to encounter. Once a former Orphanage this chilling old building lies dormant just waiting to be investigated and now you have the chance to spend an entire night of ghost hunting in this formidable old abandoned Asylum. This building is massive in size with so many spooky corridors, staircases, dens and rooms to get lost in. Down in the lower levels of the building there are a plethora of rooms to find and on the upper floors of the building the old hospital wards can be found along with the very active naughty boys corridor and across the court yard the all time ultimate; the Mortuary with fridges still intact! To date during our ghost hunts at this location we have had many different types of paranormal activity. Objects such as nails and stones have been thrown with force during vigils and items of furniture have actually moved by themselves during our séances. Loud bangs on interior doors in the basement area have been witnessed and heard by our guests and most chilling of all a direct spirit voice was heard during a vigil telling us to leave in no uncertain terms. The apparition of a young girl wearing a long white night dress has also been reported several times during our nights here and an array of white spirit lights have also been witnessed on numerous occasions throughout the many areas of the building. 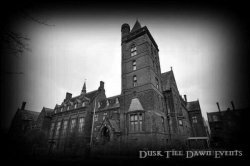 Vigils and Séances with the Dusk Till Dawn Events Team who will work alongside you in small groups throughout the night as we investigate the most active parts of this very scary location. This vast grade 11 listed building which was built in 1870 and designed by Alfred Waterhouse; who also designed the Manchester Town Hall and the Natural History Museum in London lies on 3.5 acres of private fenced off land and has an interior size of 99,000 sq ft. It is set overlooking 200 acres of parkland and a large lake and has to be one of most terrifying places we have ever visited. Now derelict this locations historical background is that of an orphanage, a hospital and in later years a nursing home for the elderly. The Abandoned Newsham Park Hospital and Orphanage has an intense and foreboding atmosphere which hits you upon entering the venue; we know that you will not want to miss the opportunity to investigate this amazing horror movie style location as we bring you this extreme and terrifying location that is sure to tick all the boxes for avid ghost hunters and anyone looking for the ultimate fear factor experience!